Here's another repress that I picked up from Hot Topic a while back. Wait, are these represses? I know Energy came out on a 12", but wasn't Hectic on a 7"? Well either way, I never wrote about these cause I was just eh about them. I'm glad I have the albums, cause they're obviously awesome, but they're kinda bland to look at. Not sure why they didn't mix up the colors. I guess they were trying to keep the costs low. I'm pretty sure I got these for a good deal though. Maybe half off cause they were running some sort of a buy 1 get 1 free sale. I think I paid 20 or so plus shipping. They came with a download card. Which could be a better quality version. I have to download it and see. I'm going to cut this one short cause these things are bumming me out. Yes, Hectic was a 7". It looks crap as a 12". 'Energy' is one of my favourite albums of all time. 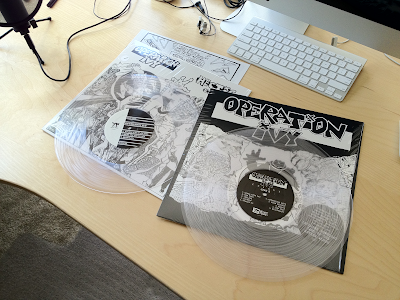 I used to be bummed that it never came on colour, but owning a colour repress does not interest me in the slightest. I'm happy with my first press on black I guess. Oh, think this comes on other colours. Think I saw it on red. I think clear is a much better choice than red.